James Aloysius McGrath, PC (born January 11, 1932) is a former politician and the eighth Lieutenant Governor of Newfoundland, Canada. As a young man, McGrath was a member of the Responsible Government League which opposed Newfoundland joining Canadian Confederation. Nevertheless, upon the province's joining confederation in 1949, McGrath left to enlist with the Royal Canadian Air Force. He returned to Newfoundland in 1953 and became sales manager with radio station CJON. In 1955, he became secretary of the provincial Progressive Conservative Party association. In 1956, he ran unsuccessfully for the party in the provincial election. He entered federal politics the next year, and won a seat in the Canadian House of Commons in the 1957 election as the Progressive Conservative Member of Parliament (MP) for St. John's East. In 1962, McGrath became parliamentary secretary to the Minister of Mines and Technical Surveys, and served in that position until he was defeated along with the Diefenbaker government in the 1963 election. McGrath regained his seat in the 1968 election, and remained in parliament through five subsequent elections. When the Progressive Conservatives formed the government following the 1979 election, Prime Minister Joe Clark advised the Governor General to appoint McGrath Minister of Fisheries and Oceans. McGrath returned to the opposition bench when Clark's minority government was defeated in the 1980 election. McGrath was not included in the Cabinet when the Tories returned to power in the 1984 election under Brian Mulroney. Instead, McGrath was appointed chairman of the Special Committee on the Reform of the House of Commons. The report he authored led to a number of procedural changes, including the introduction of election by secret ballot for the position of Speaker of the Canadian House of Commons. Its recommendations also led to the formation of the Canadian Association of Former Parliamentarians, established in 1996. McGrath also served as chairman of the Standing Committee on Human Rights. In August 1986, McGrath left politics to accept an appointment as Lieutenant Governor of Newfoundland and Labrador. He retired from the position in 1991. Upon a helmet mantled Rose and Vert doubled Argent on a wreath Argent, Rose and Vert a demi-lion Or gorged with an antique crown pendant therefrom a chevron Gules bearing in its dexter paw a trefoil slipped Vert. 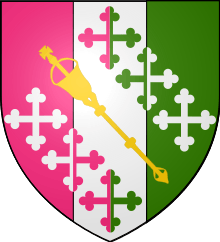 Tierced in pale Rose Argent and Vert over all a representation of the mace of the House of Commons of Canada in bend Or between six crosses botonny two in pale per pale Rose and Vert two in fess Argent two in bend sinister counterchanged. Two Caribou Argent langued Gules attired and unguled Or. On a rock Proper rising from waves Azure crested Argent. ↑ J. Barry Turner, "Canadian Association of Former Parliamentarians". Canadian Parliamentary Review, Autumn, 1996. As reprinted by The Canadian Association of Former Parliamentarians. Retrieved 2011-01-12.